Colourful pictures of emojis hang from the wall. A bunch of notes are piled in the corner. Empty Red Bull cans — meticulously organized — fill the room. This is the space where Michael Earle, known professionally as MAJE, transforms his inner words into lyrics. MAJE was raised in East Preston, a predominantly black Nova Scotian community. He moved out to Halifax a few years ago, motivated by his desire to get ahead in his music career. “I can’t see me loving anything else as much as I love music,” says the 25-year-old artist. He now lives in the heart of the North End, on Gottingen Street. Inspired by life, situations and sounds, MAJE started writing since he was 11 years old. MAJE’s main occupation is music, but he also works as a cashier at Pete’s Frootique and with kids at an after-school program. For MAJE, the process of writing can’t be rushed. That’s why his mixtape project has taken so long. DJ Uncle Fester is a local producer who has been working with MAJE since late October, recording and mixing the songs of his mixtape project. “Mike is a true artist, is one of these people who I believe is going to be doing music forever,” says Uncle Fester over the phone. MAJE considers himself an ambitious man, but he’s also a brother and a son. When he talks about his family a shy smile shows up on his face. The first time that Jean Earle, MAJE’s mom, saw her son performing on a stage was about two years ago. MAJE believes his moment has come. 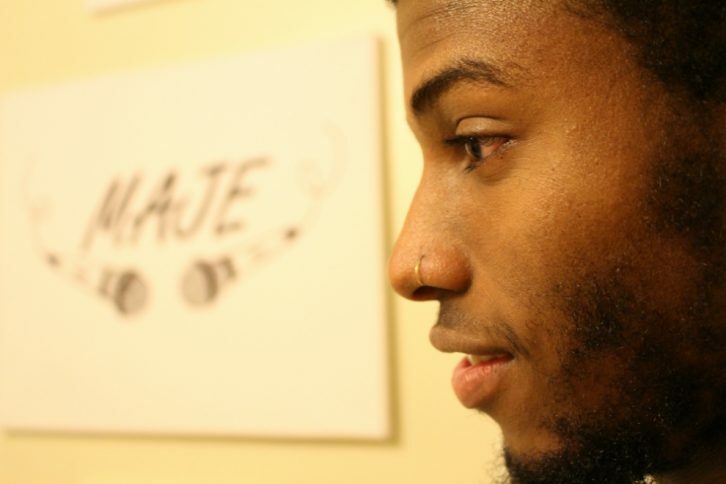 MAJE is determined to connect and resonate with people through his music.